Fighting reduced and tensions eased after bilateral ceasefire agreements were signed in 2012 by the Government of Myanmar with the New Mon State Party (NMSP) and the Karen National Union (KNU) respectively. While both KNU and NMSP were involved in negotiating the Nationwide Ceasefire Agreement (NCA), KNU signed in 2015 and NMSP waited until 2018. Regardless, military activities decreased in Mon communities after the bilateral ceasefire agreements. There have been also decreases in human rights violations targeting suspected “sympathisers” of ethnic armed groups with arbitrary arrest, extra-judicial killing, forced disappearance, forced portering and forced relocation. 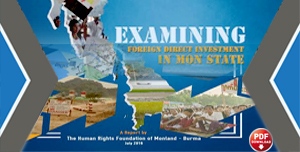 However, the Mon State, Karen State and Tanintharyi Region authorities have not been able to stop the rise of new forms of human rights abuses. Some abuses are still committed by members of Tatmadaw. Indeed, the ceasefire offers an advantage for the Tatmadaw troops as they can travel wherever they like, including areas they never reached previously. On 9 March 2018, a captain from Light Infantry Battalion (LIB)# 280 shot and killed two villagers in Magyi Chaung Wa village, located in Mon State’s Khaw Zar Sub-Township, in Southern Ye Township. Then on 16 May 2018, a captain from LIB #587 detained a local resident of Kalagoke Island in Ye Township who was subsequently killed on a military base. Both of these extra-judicial killings occurred after NMSP signed the NCA in February 2018. However, the perpetrators were brought before secret military tribunals and neither case was transferred to the civil courts. The families of these victims have not been informed about any judicial actions, findings or sentences delivered in the military courts. This lack of transparency remains a challenge for the administration of justice, especially when military personnel are involved. 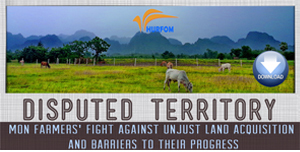 After the ceasefire, the western coastal areas of Mon State have become increasingly vulnerable to land grabbing. 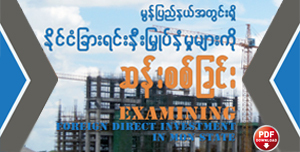 Domestic companies have tried to capitalize on the relative stability in remote areas by collaborating with local authorities to seize land for the sale of concessions to foreign investors. For example, local landowners in Kyaikmayaw Township were coerced into selling over 1,000 acres well below market rates. Concessions were then sold for foreign companies to build a coal power plant and cement factory. As relevant provisions under the Foreign Investment Law and Environmental Conservation Law were not enforced, local livelihoods have been looted. Land restitution is also a big challenge for internally displaced persons, refugees and irregular migrants who would like to return from Thailand and Malaysia. 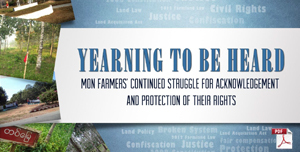 Attempts to re-establish livelihoods and reintegrate into Myanmar are so much more difficult after protracted displacement and/or mixed migration when former homes and agricultural lands have been claimed by other settlers in the meantime. State and Regional Governments, as well as the Ministry of Border Affairs and National Races, offer generalized assistance for reintegration. However, there is a gap in terms of providing restitution, or even compensation, for families who have lost their land. Sexual harassment against girls and women remains a widespread concern. According to the reports by media and documentations by human rights and women rights organizations, there were about 26 cases of sexual harassments of children or girls in 2016, and there has been no much actions taken to justice. There are two problems in seeking justice for the survivors and holding the perpetrators to account. Firstly, communities in rural areas have limited awareness of, and access to, information about laws and legal procedures. Even though some legal assistance groups are developing, they have very limited funding. Secondly, the justice system in Myanmar is notoriously corrupted which discourages victims of crime (and particularly survivors of sexual assault) from engaging with the system. 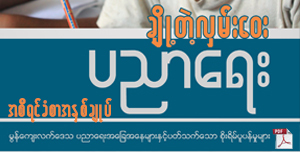 However, civil society advocacy has at least led the Mon State Parliament to form a “Women and Children’s Rights Affairs Committee” in order to monitor sexual violence and gender-based discrimination. Apart from stopping abuses and preventing reoccurrence in the future, there is also the challenge of recognizing the survivors and promoting justice for human rights violations committed in the past. 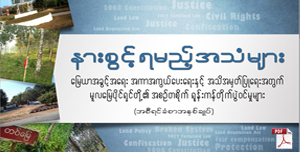 Transitional justice issues are particularly challenging because the Constitution provides immunity for Government and Tatmadaw authorities accused of committing human rights violations prior to 2008. However, many human rights violations committed after 2008 have not been brought to the courts for justice and many perpetrators still enjoy impunity. In summary, the new human rights challenges are to protect the rights of local communities to manage their natural resources and protect their environment. 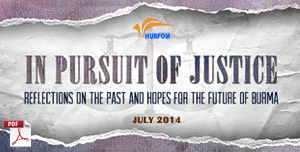 However, past human rights abuses remain as scars in the hearts and minds of survivors.